Why is it so windy in Reno? 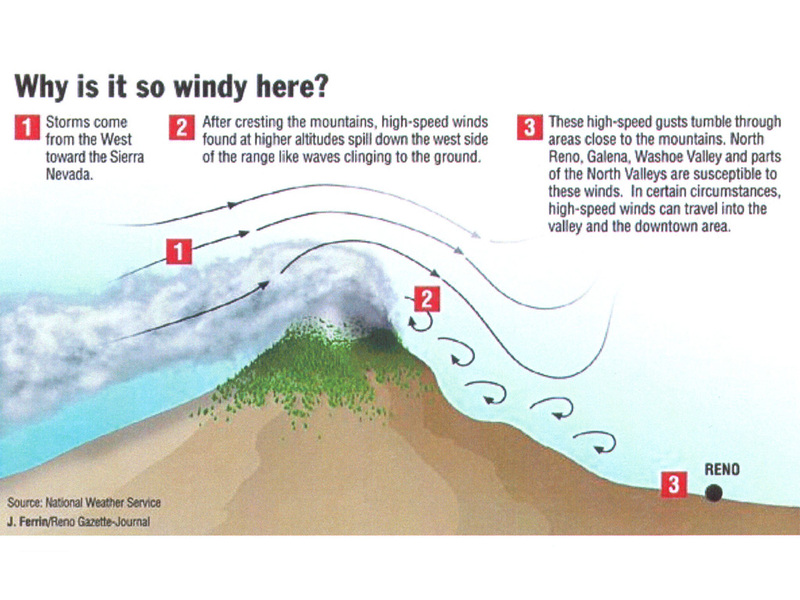 Here is an interesting illustration from the Reno Gazette-Journal that explains why very high winds frequently blow in the valleys just to the east of the Sierra Nevada. The predominant wind blows from west to east over the Sierra Nevada and high winds aloft, associated with storms, spill down the lee side of the mountain range following the terrain. These winds of 50 mph or greater spill out onto the valley floors. Winds in the Washoe Valley south of Reno are frequently of sufficient strength to over turn large semi trucks and trailers. The drawing shows how this effect works. This kind of down slope gusting is not unique to the Sierra Nevada. Those of you who live along the Front Range of the Rocky Mountains are familiar with the same effect.